Comprehensive technical details of the American built P-51D, P-51K and the Australian CAC Mustangs. Detailed photographs featuring modern highly accurate restorations, inside and out, and including under rebuild and servicing details. The North American P-51D requires little if any introduction, however reference material for it is always sought after. This book is intended to cover all bubbletop variants: -D, -K, CAC production and Cavalier production. The book is broken down in a logical way, having a 2-page introduction to the type (as I said, it does not need much introduction). Then it goes into the production series, with the –D and –K series as the main versions covered while the CAC (Australian) and Cavalier production are also covered, but not as in depth as the previous versions. You get many 1/72nd scale drawings of all the different production series. A really interesting section is a comparison of performance with other fighters of the same time: Bf-109G, Mc.202, Fw-190, P-47 and Spitfire. Let’s be clear, this is not a “how will win a dogfight”, but rather a comparison on climb rates, weight, speed, ceiling and such. Finally the book has an exhaustive section “In Detail”, which includes close-up pictures of surviving examples, drawings from maintenance manuals and some artistic depictions of the airplane interior, including a great drawing of the instrument panel. I would like to thank Model Mushroom Publisher and IPMS/USA for the review sample. The info sheet that came with this book states that it is a second edition and revision of a previous book. 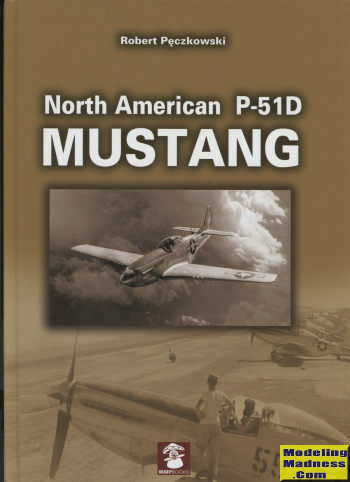 The book itself is a large hardbound edition and covers the design and development of the P-51D Mustang. It does not include the earlier A/B/C versions other than in just passing and does include the P-51K and mentions the P-51H at the end of the book. So you get a book that concentrates on the most widely produced variant, the 'bubble top' Mustang. We are provided a nice history of the development of this variation, which differs from the earlier version in its cut down rear fuselage and the slightly different wing. One can basically divide the book into two major sections. One is history and development of the aircraft, which includes those built in Australia by CAC. this section is crammed full of great photos (many of them color), color profiles and some color art work. This includes a small section on warbirds and other survivors. It also briefly touches on those planes operated by other nations. The second part of the book is more detailed and is on the airframe and systems of the P-51. This makes copious use of photos of both warbird and museum aircraft along with period images and illustrations from North American's tech manuals and original factory drawings. In all, it makes for an outstanding reference for any Mustang enthusiast and some great reading and eye candy for the rest of us. It is a book that is well worth obtaining and is one that I have no trouble providing my highest recommendation. Many thanks to Mushroom Model Publications for providing the review copy. Your support is appreciated. You can get this book direct from this link. It can also be ordered from Casemate Publishing in the US and Platypus Publications in Australia.